Voting for Project Food Blog is in full force and closes tomorrow. You can read and vote for my entry here. You know you want to. It has been hot in Dallas. Not the fun, Nelly-version of "It's Gettin' Hot in Here" but rather, the "Ugh, it's so hot, I have back sweat" version. I have tried everything from planting myself directly under the air-conditioning vent (ignoring the people that have to go around me) to going outside only for emergencies (like running out of ice-cream). I had just about reached my breaking point when the kind folks at POM sent me lots of their POM Wonderful 100% pomegranate juice (and two uber-delicious granola bars) to try. As soon as I got the box, I made myself a refreshing pomegranate cocktail chock-full of delicious antioxidants (ok, so I just poured the juice in a glass over some ice but a cocktail sounds so much more exotic). But even after a glass of juice, the cloying heat lingered. I stared at the bottles of juice, hoping inspiration would strike. But alas, nothing. Except the hubster drank two bottles of juice. I knew I had to come up with something before he drank all my juice so I quickly hatched a plan to make a pomegranate lime granita. I proposed the idea to the hubster who was sneakily reaching for a third bottle of juice. The hubster was not a fan. He said, and I quote, "I don't like weird things like grenadine. I'd just like to drink my juice." I was about to go all lawyer on him and point out that a) granita was not grenadine and b) it wasn't his juice. But really, it was too hot to lawyer (and that's saying a lot). So instead, I explained that granita was like a cross between a popsicle and a slushie. Suddenly, the hubster was on board. 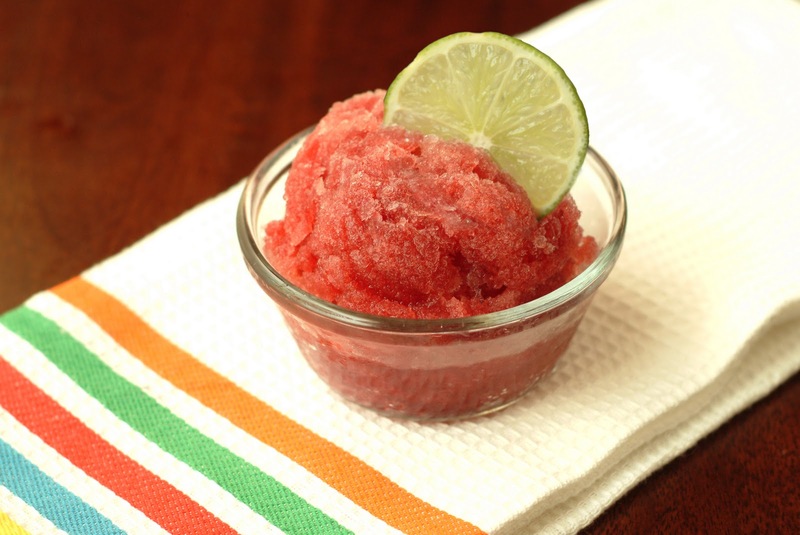 We quickly concocted a mixture of POM and fresh lime juice (with plenty of delicious, lime'y pulp for texture), added a small drop of honey, and set it to freeze. Every hour, we took the mixture out to stir (and helped ourselves to a generous taste). Because we wanted to make sure it was freezing properly. Right. By the time the entire bowl was ready, we only had half the mixture we started out with so I'd really recommend making a double batch if you plan on taste-testing along the way. Once it was ready, the hubster and I enjoyed the most perfectly tart and refreshing bowls of pomegranate-lime granita. And after it was all said and done, the hubster still insisted on calling it grenadine. And the back sweat returned full force. In the interest of full disclosure, the good folks at POM Wonderful sent me a box of 8 little bottles of POM and two of their POM bars to try. The juice was used in the making of this granita. The bars were eaten waiting for the granita to freeze. Mix all ingredients in freezer-safe bowl. Freeze for one hour. Take the bowl out and stir. Freeze for another hour, take the bowl out, and stir. Continue this process until mixture is frozen thoroughly and you have delicious POM flavored ice crystals. Spoon into a serving dish. Find a quiet corner and enjoy your treat before someone finds you and insists you share. I wish we had some Dallas heat here !!! Looks delicious, I actually tasted the POM juice for the first time yesterday so will bookmark this for future use. Love Granitas & I already voted! Good Luck Azmina! I get that alot " i don't want to eat weird stuff" lol its always difficult to get desi guys to experiment with new kind of things even if its as simple as granita! Azmina this looks delightful and refreshing. Perfect use of good quality Pom juice! What a great cocktail Azmina! This is the perfect way to beat the heat. Although we're already down to single digits (celcius) here, I'd still enjoy this drink. Love the beautiful colour too. Always love your cute sense of humor. You and Ameena definitely know how to start my day off right :-D. Already voted for you. Best of luck in the challenge my dear. Have a lovely day. You are so creative - when POM sent me samples I had no idea what to do with them. Ali drank them faster than I could think up a cool recipe like yours! I have never had a granita before! I need to come visit you for many reasons but mainly so I can have my first granita! Looks great...love tart flavors lately!! I gave you some voting love yesterday! I'm jealous of everyone being able to do fall cooking, while it's still summer-like here in Texas. I made margarita ice cream on Sunday since it was so warm!! Yeah- I definitely poured my POM juice with some club soda and just chugged it down. Now you're making me wish I still had some left. I used mine to poach pears but POM and lime; what a match made in heaven. I love it!! 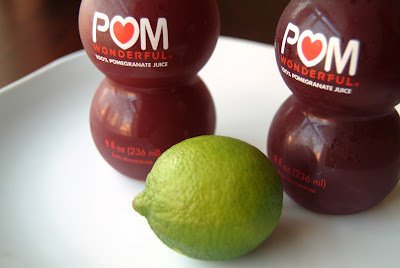 Pom is one of my favorite flavors and I much prefer lime to lemon. I voted for you by the way!! I could use some now. Its so hot! Great recipe my dear (= and always I giggle when I read your posts. Love it! Love the disclosure. Hubs are always crankier in the heat. I remember that sticky sweaty "didn't I just shower" heat. Perfect treat for that. i'd die for that weather now!!! Luucky! I want some free POM juice! ha This looks delicious.. I love granita because its so easy and pretty healthy as far as dessert is concerned! ps I didn't realize you live in Dallas! I live a couple hours down the road! A perfect way to deal with excessive heat! Oooh "a cross between a popsicle and a slushie" is an amazing way to describe granita. And clearly it worked. It's so pretty and looks refreshingly delicious! I heart POM- this granita looks good, especially since it was in the 90s today! I enjoyed your story about the juice and convincing Hubby about granita. :) Your granita turned out a gorgeous color and I'm sure was so welcoming and needed with the hot weather. So nicely done! You dealt with the heat and hubster in exactly the same way I would! Love the look of the red granita and the way you made hubster agree with you in a non-lawyering manner (although you and I know better. *winks*). I miss living where pomegranates are in everyone's front yard, but POM is so much better for stuff like this anyway! Totally love the pom/lime combo, so this will happen in MY freezer sometime SOON. Thanks, lady! wow! samples?! looks delish and refreshing! I recently came into a heaping amount of Pom Wonderful too and this will definitely find it's way into my freezer. This is definitely what I want to gobble down when it's hot out. Maybe a triple batch next time, to take into account both the taste tests and the constant reappearance of back sweat? :) I'm bookmarking this recipe for hot weather - or maybe even cold weather, if I can't wait that long. Ugh it is pretty hot here too and we are so many latitudes above you guys! I can't even imagine. I would need like five bowls of this to quench my back sweat. And also just because it looks so good that. Well. I would just need five bowls. Looks delicious! when my mother-in-law was doing chemo, water tasted horrible to her and the only thing she could stand to drink was pomegranate juice mixed with lime sparkling water. She would LOVE this. And, yes, it is very hot in Texas. At least, in our area, we're lucky to be getting some rain! Every time I see a POM dish in blogs I wish we had it in Finland too! What a great way to cool off! I remember those sweaty days back in DC and no A/C. I'm going to have to hide mine away from my dad and brother as well. When I told my dad about the POM being sent to me, his eyes got all big. I'm totally going to make this too. Sooo good. Sounds like my husband! 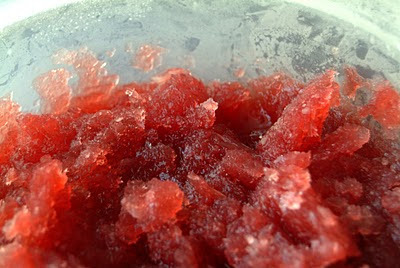 I remember that Dallas heat and it is killer - you're granita looks like a perfect way to stay cool!! this is new to me!! wow ive never seen POM used for a granita!!! <3 LOVE IT!